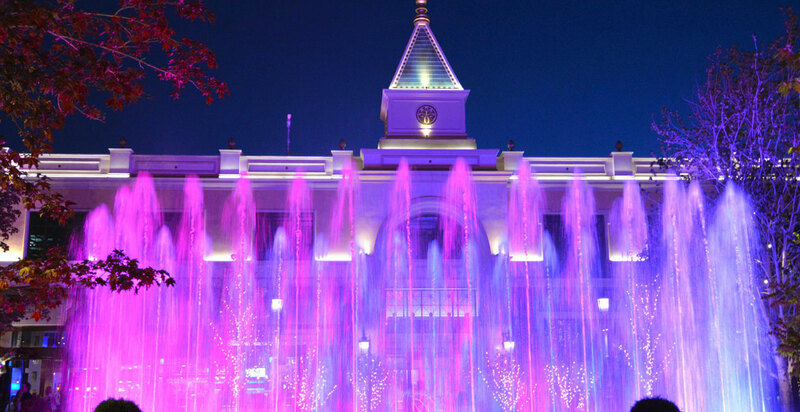 Choreographed to light, music and fog effects, this 65,000-gallon, state-of-the-art show fountain features three types of programmable nozzles, synchronized to produce a dazzling display of artful motion. As part of a master plan conceived by the internationally renowned landscape design firm Lifescapes International, OTL masterfully designed and constructed this two-tier water feature using sixty-seven vertical chaser nozzles to produce booming jets of water programmed to “chase” each other in orchestrated succession. Six motion-based nozzles, each specially engineered with a rotating head atop a dual-axis flow system, allow water to propel in every direction, creating a whirling water dance. Each nozzle’s own light and variable frequency drive (VFD) allow OTL optimal water and programming control. Two basket weave nozzles introduce a basket weave spray that gracefully intertwines with the other water effects, producing a swirling and latticed ballet of water and a crowd stopping show experience. Create a unique outdoor retail experience where a show fountain creates a draw for visitors, events and gatherings.